On Sun Jan 18 at 12 noon GMT LEARNING2GETHER met with Tom Robb, one of the creators of MReader (http://mreader.org), a free system for providing quizzes to graded readers and tracking student progress with them. MReader was created to allow the Extensive Reading approach to be implemented in any class with access to graded or youth readers. It frees the busy teacher from the necessity of keeping track of what students have read via time-consuming reports and other feedback mechanisms. Even for the teacher already “sold” on the ER approach and who is willing to take the time and effort to counsel students, adoption of MReader presents an additional means of motivation for students, who can confirm their understanding of the books they have read and slowly amass a collection of book covers on their personal page. MReader has over 4400 quizzes as of this writing (January, 2015) and the number is growing. The goal of the project is to have quizzes available on all ‘graded readers’ as well as the most popular native-speaker ‘youth readers’. In this session, Tom Robb discusses the software, its development, its “gamification” aspects and the community effort behind it. The K12 Online Conference is an all-volunteer, noncommercial effort, which means we rely completely on the contributions of generous volunteers. If you’ve ever thought about getting more involved with K12 Online, now is the time! On Mon., Jan. 12 at 8:00pm ET, we will be livestreaming a video hangout here to talk about volunteer opportunities for the 2015 K12 Online Conference. There are a wide variety of ways to contribute, from marketing to presenting to working on live events. Some of these things only take a few minutes, while others are more involved. However you might like to be involved, there is an opportunity for you! If you can’t join us for this hangout but are interested, please fill out this short form and we will also post an archive of the session here. We greatly appreciate our community’s support and help, and look forward to a great 2015! 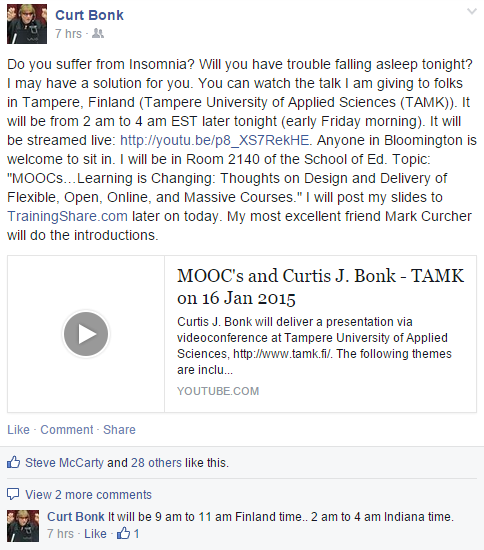 Curtis J. Bonk delivered a presentation via videoconference at Tampere University of Applied Sciences,http://www.tamk.fi/.